Cauliflower has suddenly become a trendy vegetable, and one of the best ways to serve it is roasted whole. It can be served with any kind of sauce you like, but here I'm using a Spanish-based romesco sauce. Preheat your oven to 210°C (410°F) for a fan oven, or 230°C (446°F) for a conventional one. Remove the stalk and innards from the peppers and pop them in the oven for 20-30 minutes. The flesh should be tender, and the skin should be charred. If you like extra charring you could zap them with a blowtorch or hold them over a gas flame. While the peppers are roasting, half fill a large pot with water, add 2 tsps of salt and bring to the boil. Trim the outer leaves from the cauliflower, but leave a couple of centimetres (about an inch) around the bottom. Trim the main stalk at the bottom so the cauli sits flat and level. When the water is boiling, place the whole cauliflower in it. Top up with extra boiling water if needed so the the cauliflower is more or less covered. Put a lid on and cook for 8-10 minutes, depending on the size of your cauliflower. Remove it from the pan and place it upside-down on a couple of sheets of kitchen paper. Let it dry for at least 10 minutes. Melt the butter in a small saucepan and stir in half a tsp of smoked paprika (if you can get authentic Pimentón de la Vera, this is the best), and the thyme. Place the cauliflower, right side up, into a baking tin and paint the melted butter all over it using a pastry brush. Pour in about 1 centimetre (half an inch) of boiling water and put it in the oven. Roast for about 20 minutes, then check for doneness by inserting a skewer right into the centre - it should go in easily with maybe a small amount of resistance near the core. The outside of the cauliflower should be a bit crispy and golden. Peel and finely chop the onion, mince the garlic and sauté in olive oil on medium heat for about 5 minutes - the aim is to soften them, not brown them. Chop the charred red peppers quite small, add them to the pan along with the tomatoes and a tsp of smoked paprika. Stir well and cook for about 5 minutes, then puree the sauce with a stick blender, or whizz it in a regular blender. Ladle the sauce onto a platter, and place the whole roasted cauliflower in the centre. The video above is from the Keef Cooks YouTube channel. 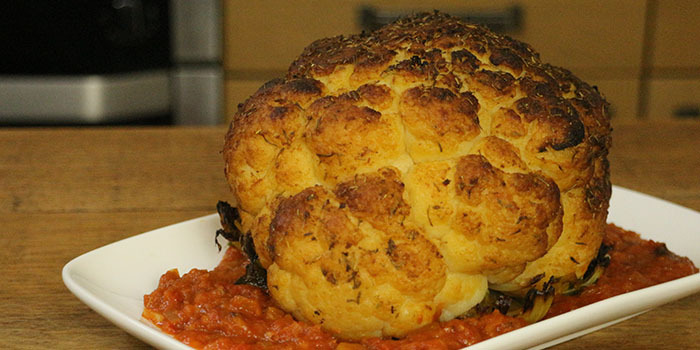 Click here to see the video recipe of Whole Roasted Cauliflower with Romesco Sauce on YouTube.